Now that the Electra iOS 11.3.1 jailbreak is out and there are plenty of people who are giving it a whirl on their iPhones and iPads, jailbreaking is a much more simple affair nowadays than it was back when the iPhone was brand new, but that does not mean that it is not without its potential issues. 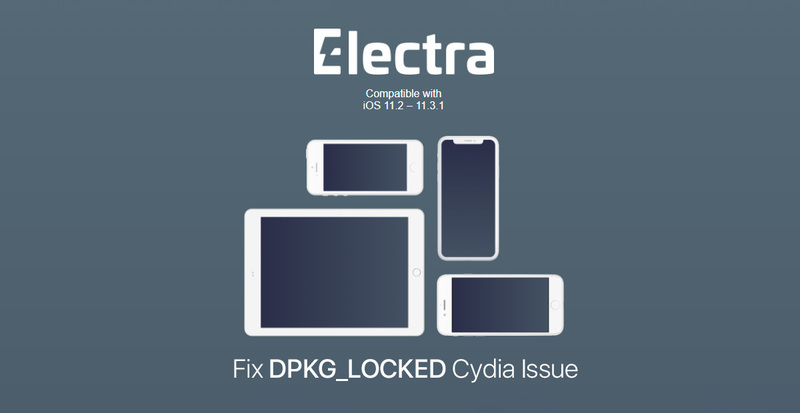 The new Electra iOS 11.3.1 jailbreak is absolutely no different here, and a number of users have started to report that after attempting the jailbreak, they are being presented with an error in Cydia labeled DPKG_LOCKED. The error itself is fairly nondescript, but it does unfortunately prevent the jailbreaker from adding dependencies to Cydia. That’s no good at all, so here’s what you need to do in order to get things back up and running before attempting another jailbreak. The short version is simple – just remove Electra and re-jailbreak, but here’s how you actually go about doing that because it may not be immediately obvious. With that all said, let’s crack on. Step 1: Download the Delectra script (unjailbreak.sh) from github.com/KirovAir/delectra. Step 2: Using WinSCP or Cyberduck (or your favorite FTP tool), connect to your iOS device and put the newly downloaded script into the ../../electra folder. Step 4: Now, run the command “sh unjailbreak.sh”. Step 5: This will completely uninstall Electra from your device. Now we’d suggest having another go at jailbreaking your device using our Electra iOS 11.3.1 tutorial in the hope that things go a little better this time. We can’t promise anything, but starting afresh from a completely clean starting point can often be all that is needed to make things work as they should. where exactly is the path for the file and does the read me need to be included . I have an unrelated questio to this topc but ive got everything working except my device seems to be in safe mode. Cydia and filza work but non of the tweaks (compatible) i install work. Any help? you have to press space between cd and ..
this will only work if openssh came when you got cydia. i unfortunatley did not and have no way into my files and cannot ssh. put the newly downloaded script into the ../../electra folder. ?? Okay but how we connect the IOS device to the FTP tool ?? It does seem like no help whatsoever. There is no instructions as to where to find ../../electra folder. Only @nick cooney got the whole thing. Just sharing this in case someone still have no clue finding it. I use WinSCP as FTP tool. After you done log into your phone, you will be directed to “var” file.